Between 1950 and 1952 Salford City Transport placed in service 195 Daimler CVG6 double deckers with Metro-Cammell Phoenix bodies, all featuring Birmingham-style straight staircases and traditional polished wood interior window frames. 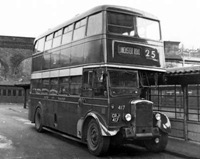 Apart from another 15 CVG6s with Burlingham bodies purchased at the same time (a mixture of single and double deckers and a committee coach), there were no further additions to the fleet until 1962. For ten years, therefore, the Phoenixes acted as the backbone of the fleet, and outside the rush hour they would most likely be the only Salford buses to be seen by a casual visitor to the city. To me, they – and the spirited manner in which they were usually driven – were the very essence of Salford. Here 417, dating from 1950, is seen in Victoria Bus Station in 1968, by the end of which there were still almost 70 survivors, the last 48 being passed on to SELNEC the following year. Victoria bus station shown here was in Salford but long-distance services terminating there showed "Manchester" as their destination! The only local destination which Salford City Transport buses could not show was "Salford". Charles Baroth’s tweaking of the Phoenix design (straight staircase, destination screen winder assembly, and the fairing on the nearside front mudguard – not to mention the shortened radiator) made the two Salford batches distinctly different to the two batches of Daimlers with Phoenix bodies delivered to Manchester during the same period. Whilst not looking as smart as the original scheme of green with three cream bands, black wheels and silver roof, the vehicle in the picture belies its age, especially as it is one of the first batch. The second Salford batch was delivered in 1951 and should have been registered in then FBA series of Salford registrations but Charles Baroth persuaded the Salford City Police, who issued registration marks at the time, to issue FRJ some months early so all the vehicles he ordered would have RJ sequence marks. The last six of the type delivered to Salford FRJ 555-FRJ 560 (555-560) were fitted with heaters and were much pursued by the enthusiast fraternity as for the first nine years of their lives they operated almost solely on all night services, retreating to the depot as the sun appeared. Both Salford and Manchester passed substantial numbers of these vehicles to SELNEC. Given the constant all day, daily use to which both authorities put these vehicles for almost all their lives, it says a great deal about the workmanship that went into manufacture of the chassis and bodies and the standards of maintenance carried out by their owners. When SELNEC eventually withdrew the remaining vehicles a bit of the post war character of the twin cities went with them. Having suffered these buses on the joint service 95/96 for many years I certainly wouldn’t be able to describe the way they were driven as ‘spirited. Salfords Daimlers were the slowest buses on Kingsway, Manchester by far, even slower than Birchfield Rd’s Crossleys. I well remember the groans that went up at my bus stop on Kingsway when one of these appeared over the crest of the hill at East Didsbury. I wonder if the slow performance of the Salford Daimlers on Kingsway was down to the Salford crews "pushing" Manchester vehicles in front on the same or similar routes, i.e. allowing the Manchester crews to pick up the bulk of the passengers thus lessening the workload for the Salford men as they would have few if any passengers to pick up after the first few stops. "Pushing" was a common practice where routes were jointly operated, some crews becoming adept at the practice. As long as the joint operation was on an equal shared income basis the practice, though officially frowned on, did not work to the financial detriment of the employers of the "lazy" crew. Another trick was to load the bus at the first few stops so that the three bells code was given and, in rush hours, the crews would have an easy time with few stops, few fares to collect after the first trip around the bus and they could still dawdle as they had to keep to timings, yet could legitimately drive in a stately fashion past lines waiting for a bus with room. These Daimlers look decidedly odd with their short radiators, something I never was aware of until today. I used to think that LT’s STL’s looked smart, until I saw photos of some ‘unfrozen’ ones that had been given AEC’s longer radiator, which incorporated the number plate, as were the immediate pre-war Green Line T’s. Long radiators rule! With regard to Geoff’s comment about destination displays, Salford does not have a city centre. Therefore if a bus in Bolton had shown Salford as its destination, where would it be going? The reason for the location of Victoria Bus Station (and the Greengate terminus across the road, where most of the longer distance services went from) was to get passengers to Manchester without the buses themselves having to cross the boundary. Contrast this with a Manchester bus on the far side of Stockport showing "Piccadilly". You had to know it was a Manchester bus to know it was going to Manchester. I think the worst example of this I ever came across was much more recently, when I saw a GM Buses North vehicle somewhere between Bury and Ramsbottom showing "Arndale" (Arndale being the name of a Manchester bus station at that time, never mind the fact that there were Arndale shopping centres in other locations as well). The city of Manchester, unlike many other cities, was surrounded by a large number of historically older authorities (the Hundred of Salford outdates Manchester as an area of local government by 900 or so years and once incorporated the whole of Manchester) and these have always fought against being subsumed into what became the leading industrial, financial and legislative authority in the area whilst in many ways being dependant on the city for the provision of regionally useful services and places of employment. This has led to a number of oddities with regard to transport. The Salford use of Manchester on destination screens for Salford buses terminating at Victoria Bus station (ditto Leigh, Bolton and LUT vehicles using the adjacent Greengate as a terminus)has already been mentioned, though this was officially restricted to Salford routes originating outside of Salford. Salford buses operating from within their city boundaries displayed Victoria, in itself totally misleading and an oddity the bus station so named was closer to Exchange Station than Manchester Victoria Station. Salford thus capitalised on the proximity of the boundary formed by the River Irwell to Manchester’s city centre, a centre being something Salford didn’t possess. Then there was the case of Manchester Docks. The nine docks of the Port of Manchester at the eastern end of the ship canal were basically in Salford and Stretford, only one dock being within the Manchester city boundary. Salford buses bound for the dock gates in Salford neither recognised the Manchester part of the title, nor tried to claim the docks for their city, stubbornly just showing DOCKS in block capitals as a destination. Salford buses heading for the inner areas of Trafford Park, which was in Stretford, would display the destination as a road name, such as Tenax Rd, whereas Manchester would display both Trafford Park and the point in the Park to which they were going. There was little love lost between the Frederick Rd Salford and Piccadilly Manchester head offices. Charles Baroth taking over a run down fleet promptly changed the livery from a very Manchester like red and white to the dark green and cream and changed the name of the department displayed on the buses from Salford Corporation to Salford City Transport – making a very definite point. He and Manchester’s Albert Neal never really seemed to get along – an antipathy that lasted from the mid 1940s to the early 1960s. Slightly before Salford changed to the green livery, Bury changed from vermillion and cream to a light green and cream. This led to a story about the stranger heading for Patricroft, an area on the western edge of Salford’s territory, who had been correctly directed to Victoria Bus Station and told to take the Peel Green bus. Approaching the bus station from the Cathedral end where the street is above the roof level of the buses on the stands and seeing only red and white buses, he asked a woman on the street where he could get a peel green bus. The woman had noticed the green Bury bus which left from Cannon Street and and with apple peel in mind directed the stranger on a five minute walk to a bus heading nine miles at 90 degrees from the direction the stranger needed to take. I can just remember seeing these near Salford perhaps in the late 60’s: they looked – then- wonderfully vintage in their heritage green livery, a bit like the old WY-York Bible board buses in York. Presumably the radiators look a bit forward (not only short!) because of the Gardner engine- I don’t recall seeing exposed radiator CVGs as opposed to CVDs: did they have "Daimler" preselectors? The Salford crews weren’t pushing the Manchester crews. The 95/96 operations consisted of about an hour of Salford running followed by around the same amount of time by Manchester running throughout the day. Salford running from East Didsbury began about 9 a.m.on a broadly 10 minute headway. There was no was route to push other than the 40 and for the most part that wasn’t taking the same passengers unless they were going to alight on Kingsway. The situation altered completely when the Salford front entrance PD2/40’s were introduced in the mid ’60’s. Now they were lively performers and completely outclassed Birchfield’s CVG6’s for speed on the route. Joe, Manchester had 90 very similar vehicles, all with long radiators and all CVG6s. They also had 100 CVG5s again with exposed long radiators. All the Manchester vehicles had preselector gearboxes as did the Salford vehicles. Previously Salford had taken 8 CVD6s, again with short radiators and preselector gearboxes. The shortened radiator had an advantage in as much as the lower part was purely cosmetic and, according to Baroth, suffered from damage so, a double saving was made in terms of new and replacement costs. Joe: I can’t say I’ve ever noticed the radiators on CVG6s being further forward than on other Daimlers, but I suppose it’s possible, as the 6LW was longer than other engines. There are lots of exposed-radiator Daimlers to look at here sct61.org.uk/index/chassis/dv . Yes, they did have Daimler preselectors, with a quadrant selector under the steering wheel, just like Daimler cars. I have distinct memories of seeing Bury buses in Bolton, on the 52 and 23T, but only vague memories of Salford buses there, as Phil B mentions above. Was that the 8? Joe – These Salford Daimlers had preselector gearboxes. I understand the short radiators were used to minimise damage to the bottom part of the radiator grill. Have you noticed how many English cities seem to go in pairs? Pete, Salford had two routes to Bolton. The 8 and the 12, the latter taking a circuitous route via Daubhill, Little Hulton, Walkden, Roe Green and Worsley taking a scheduled 55minutes against the rather tightly timed 38 minutes of the more direct 8. Jim, an interesting comment. I can’t answer for the other places, but the only pairings that most folk in Southampton and Portsmouth would acknowledge are that they are both in the geographical (but not administrative) county of Hampshire, and that they have the same bus company (Worst). On the sporting front, it doesn’t happen now because they are in different leagues, but the "South Coast Derby" between the two always required an even heavier Police presence than most other matches. It’s as bad as Rangers and Celtic! Orla, you have more knowledge of the 95/96 workings than I but something must have been going on as, from a very limited personal use of the Salford CVG6s (a number of trips on the tightly timed #8 to Bolton and back and one trip to and from Warrington on the #10) I recall they were smooth, reasonably quick and in places gave a fair turn of speed. At one period I used to have to use the Manchester versions on the #47/48 and they could certainly motor. Easter 1957 a school pal and I travelled from Reading to Grimsby and back via Salford, all on service buses. Quite apart from the fascinating stuff we saw and rode on the way up, across and back down again, the Stockport and Manchester Crossleys made a great impression, and so did the great variety of operators working into Manchester, but I remember being especially taken by those lovely Salford Daimlers with their straight staircases, destination-winder trunnions and the no-nonsense, upright Metro-Cammell bodies. They also seemed to get a move on, but I didn’t like the way at least one of the drivers let the gear pedal smartly up between changes, without any adjustment of engine revs, resulting in a bang and a jerk. To have lasted so long with such rough treatment these wonderfully characterful vehicles must have been as solidly-built as they looked–or were the fitters kept busy? Thanks Peter: I can spend many a happy hour now trying to work out the relationship between CVD/G/A’s , their radiators and the front dumb irons. Was it the body builders’ variable fronts, or did Daimler provide a deeper radiator tank cover to bridge the G gap. I bet someone knows! In the meantime, I’ll keep puzzling. Interesting comments about destinations and cross-boundary rivalry. I read that Salford always put their newest buses on the 15, which ran to Piccadilly, to impress their neighbours "across the river". When I worked for GMPTE a few years ago, buses were using Exchange Bus Station, which was on the site of the old Victoria Bus Station (of course by then Exchange railway station was long gone). This has now been superseded by Shudehill Bus Station, which is actually in Manchester, and the whole area around Victoria Bridge Street is being redeveloped. And yes, I agree about "Arndale"! I drove for Salford from 1966 to 1968, primarily on the 95/96 route to East Didsbury from Whitefield always with the Daimler pre select, they took some getting used to and, they were abused by a lot of drivers throwing standing passengers backward through their violent gear change. On the radiator subject I only ever remember the radiator was far forward and was informed at the time it was because of the longer engine. My first encounter with the forward entrance Leylands was on the 73 from Whitefield to Victoria, a pleasure to drive. Ian Thompson, you’ve let yourself in for it now! Your epic trip from Reading to Grimsby via Salford sounds worthy of an article, describing route, rolling stock and how long it took! Might we be hearing from you shortly? Pleaaaaase ? David, I’m rather amazed by your remarks re driving the Daimlers. Now, first off, I’ll acknowledge I have never driven a Daimler preselect bus but I have driven preselectors on other vehicles and also, during the last 48 years, a vast range of different gear boxes, rarely with any problem. Given that the Daimlers had not only been in the fleet for 16 years by the time you started but for the majority of those years had been the bulk of the fleet and given newer Daimlers with preselector boxes had entered the fleet in the early 1960s, I have to ask where the fault lay – bad maintenance or poor driver training after the departure of Charles Baroth? Stephen: the brains behind the Reading-Grimsby trip was Chris Bates, who planned it all to a tee and took plenty of photographs. We stayed with his relatives in Nuneaton, Hazel Grove and Grimsby, without whose kindness we couldn’t have done it. Chris repeated the trip in 1958 with Graham Low (who’s taken thousands of bus photos since the mid fifties) and that trip made the subject of an excellent presentation they gave at an Oxford enthusiasts’ society meeting. I’ll suggest to them that we do a joint article. Thanks for the idea: I’ll see what we can come up with! The radiator on this one doesn’t look like a Daimler radiator at all, although I’m sure it is but there appears to be a badge on the top which I’ve never seen on a Daimler fluted radiator before. I agree it appears to be thicker too, although I don’t see why it should be, other operators specified the Gardner 6LW which was accommodated without difficulty, notably SHMD, although I wonder if in some cases, the bonnet and radiator were moved forward, whereas in others, the bulkhead was moved backwards. Charles Baroth had all manufacturers’ badges removed from all makes and replaced by a standard badge which had a green background and Salford City Transport in cream. 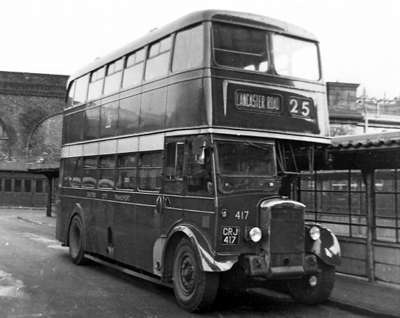 There was no difference in the bonnet/radiator length between the Salford Phoenix bodied CVGG6s and those supplied to Manchester. The Manchester Phoenixes had their engines derated to 100bhp at 1650rpm. From my experience of the Salford ones I would imagine them to be the full 112 at 1700. I know exactly what David means about violent gear changes, and it wasn’t a fault with the vehicles or necessarily driver training. No matter what training you give a driver, if he wants to ignore it he will. I used the Manchester Phoenixes regularly in the rush hour, and it did seem as if some drivers took delight in seeing how many standing passengers they could catapult on to the platform when changing from first to second! This was something probably unique to the combination of 6LW engine and spring-operated gearbox, since AEC Regent IIIs had air-operated gearboxes, and other engines packed less of a punch at low revs. Salford’s engines were left at their original rating whereas Manchester’s were originally derated to 91.5bhp being partially uprated to 100bhp with the K upgrade in 1953 which amplifies the oddity of Orla’s experience on the 95/96. Peter Williamsons’s comments on the spring v air operated preselector boxes begs a question – from 1949 Manchester’s orders were split between Leyland and Daimler, Salford had a preponderance of Daimlers. There will always be "rogue" drivers but with large numbers of Daimlers operating in the area was the misuse of the gear change system widespread? If it was there surely would have been complaints to the Manchester Evening News Postbag – always a barometer of public opinion – and the MEN was no friend of either transport department, always willing to "have a go", but I can’t remember seeing any reaction in its pages until complaints about snatched changes when the Atlanteans started work for MCTD from Sharston depot. I’ve noted the comments on ‘rough’ gear changes with preselector transmissions. I’ve driven both air operated and spring operated preselectors and there is still a need to match road and engine speed when making gear changes to ensure a smooth change. Admittedly preselectors, and semi automatics for that matter, are more accommodating in this respect, hence a ‘jerky’ change, than a ‘crash’ gearbox where a mismatching of engine and road speed results in a nasty noise from the gearbox. With a synchromesh gearbox there is still a need to match engine and road speed to ensure a smooth change and a mismatching results in a rough change such as can happen with a change down from, say, third to second without making sure that the road speed is right for such a change. With reference to the above comment about MCTD’s Atlanteans (the inference being these were MCTD’s first) entering service from Northenden depot (which, of course, was actually at Sharston) I am sure I have seen another reference to this elsewhere on this forum, the suggestion being that Northendsen was chosen as the Atlanteans’ first depot since, Northenden being renowned for being the most militant depot, if the Atlanteans were accepted there they would be accepted anywhere. It is my recollection that it was reported in ‘Buses Illustrated’ at the time that the Atlanteans had entered service on route 50 (in those days, Albert Square to East Didsbury) operating from Birchfields Road depot – which route 50 passed. Is this not correct? The Atlanteans aka the ‘Red Dragons’ as the Manchester Evening News named them, were first employed from the Northenden garage on route 101, the limited stop service from Greenbrow Rd, Wythenshawe to Piccadilly. Their introduction there was delayed by several months until the unions were pacified. At the time, as a schoolboy in Manchester we were very jealous of the lads who used this service on these ultra modern buses as we then saw them whilst we had to content ourselves with ancient looking Crossleys (how times change). Imagine my delight when, shortly afterwards, they were employed on the, local to me, route 40 (it didn’t become the 50 until the Wilmslow Rd corridor renumbering farce of January 1968) though I don’t recall them being fielded by Birchfields Rd garage (primarily a Crossley and Daimler depot then) but rather by Parrs Wood garage (the Leyland depot) at their East Didsbury terminus. The Princess Rd corridor serving the various estates which made up the Wythenshawe overspill – at the time the largest local authority housing development in Europe – was MCTD’s most intense operation in the late 1950s. In mid 1957 the Transport Committee approved an order for 110 PD2s with the revised Orion bodywork that MCW and MCTD had been working on for around 2 years. Leyland made much of the order in its advertising, particularly as there was no balancing order for Daimlers. All but 10 of the vehicles were delivered in the financial year 1958/9. The order for the remaining 10 was changed to Atlanteans with MCW bodies with the intention of running them on the Wythenshawe routes to assess the value of the extra capacity and the reduction in loading times given the driver could control the platform and doors. When the order was announced the union asked for negotiations regarding the extra capacity and the extra responsibilities of the driver. As it was Sharston was the most militant depot so the adding of the vehicles to its stock in November and December 1959 in the absence of an agreement precipitated an official dispute. No drivers would touch the vehicles so their rare appearance on the roads of south Manchester was in the hands of inspectors or members of the engineering staff. I made a number of visits to the depot at the time and was able to have a good look around them (inside and out) due to the generosity of the foreman. It took until April 1960 to conclude negotiations leading to an agreement covering all types of large capacity vehicles across the Department. In April 1960 the 10 Atlanteans commenced work on the 101 from Piccadilly to Newall Green. Over the following months they were used on other Princess Rd services and also the 50 which in those days was the route number of the Piccadilly to Brooklands via Northenden service. In 1961 they all moved to Parrs Wood and were used on the 40 Albert Sq to Parrs Wood. In 1963 they moved to Queens Rd. They were not stabled at Birchfields though they did visit the depot in 1966/7 when the BUT/Burlingham trolleybuses were withdrawn to have their uncomfortable low backed seats replaced by those from the trollies. Rough gear changing with any type of gearbox is almost invariably down to driver attitude rather than mechanical deficiency. Only when facing uphill is it necessary to start in first gear; second gear is entirely capable of level starts with quality buses. With crash/constant mesh gearboxes, it repays the driver to try to double declutch properly to make sensible progress, and voluble protests from such gearboxes are a testament to driver incompetence. With preselectors (and later with semi automatics) lazy drivers would keep the right foot down on the accelerator whilst operating the gear change pedal (or gear selector). The result With preselectors was a violent jolt to the transmission. Semi automatics would give a less severe jerk, but the fluid coupling would suffer eventually from having to absorb, totally unnecessarily, the forces of such abuse. When fully automatic transmissions began to appear, these initially incorporated extra buttons/selector positions that allowed the driver to hold intermediate gears, but misuse by a minority has now rendered this feature to history with most modern buses. Nowadays, the driver has no direct control over the gearbox in the majority of present day large passenger vehicles. If you were the individual who had to change a clutch due to drivers not using all the gears provided, at your own expense, I’m sure you’d be a bit more canny about your second gear setoffs. Driving schools do have their own agendas, and perhaps taught drivers to make fewer gearchanges so that the potential for getting them wrong was reduced. Bear in mind also that vehicles generally were lower powered than they are today, had fewer gears, had a relatively low top speed, and had components that were generally over-engineered. While 2nd or even 3rd gear setoffs are clearly possible it is neither best practice nor mechanically sympathetic. For example a Leyland PS2/PD2 could have had a choice of three rear axle ratios which, with a standard O.600 engine and four speed gearbox, could have a top speed of approx 30, 40 or 50 mph. I look after two such vehicles capable of either 40 or 50 – should any driver be seen setting off in 2nd gear in either, they would not be driving very far ! I took my test in the faster vehicle and was expected to use all gears both up and down the box. In the past there wasn’t a minimum speed limit for a test vehicle and I know of vehicles being fitted with low speed diffs so that trainees would only need to use the top three gears – if the top two had synchromesh, how easy would they be to use. But then consider this, having passed their test in a double decker with a top speed of 30mph they could then jump in a six wheel Neoplan Skyliner and head off down the motorway to Spain. Don’t laugh, it happened regularly in Leeds in the eighties. Where was the sense in that ? When riding in preserved vehicles of the types that feature heavily on this site it makes me cringe when novice drivers are let loose with the general public on board happily crunching gears, coasting in neutral around tightening bends, roundabouts etc, staying in top gear while descending hills etc. We should be campaigning for quality and competence and then the vehicles we all enjoy will continue getting out & about and not lie broken in the corners of sheds or, worse still, get consigned to the breakers yards. In response to the above, of course you were expected to use all the gears on test. So was I, and, also, I had to show that I could bring a bus to a halt using all the gears in succession, but no brakes, in the event of brake failure. It wasn’t expected that this should be the stopping practice in normal service, though. Pulling away in a bus with clutch and conventional gearbox is entirely possible in second gear without undue clutch slip. One can feel the clutch engaging almost immediately at very low revs, and release the pedal accordingly. In many gearboxes, the first gear was a crawler, and if the bus was started in that gear, by the time that the revs had died and double declutching had taken place, the vehicle would have come to a virtual standstill. On the AEC Reliance with five speed synchromesh box, first gear could be engaged only by lifting the gearstick over a protective "ledge". Changing down from second whilst on the move would have been impossible without removing both hands from the steering wheel. I am satisfied that the designer regarded first as a crawler only, and did not expect first to be used for moving away in normal service. Of course, clutch abuse took place in every bus fleet with conventional transmissions – we have shown above that every fleet has its rogues – but second gear starts, properly effected, would not, in themselves, have caused greater clutch wear. No doubt your view may well have been shared by some fleet engineers, but, in 43 years in the bus industry, in various roles up to management level, during which I drove a great many vehicle types, I did not hear that opinion expressed by an engineer in the undertakings that I worked for. I’ve only driven buses under L plates or around large depot yards but I have 48 years driving experience around the world in a wide range of cars and vans/trucks up to 7.5 tonnes amassing almost 1.5 million miles in that time. I was taught to drive by a police instructor and a bus driver who was also an instructor for his employer. They taught me that driving was both an art and a science, an appreciation sadly lacking in many of today’s motorists and so called "professional" drivers. I was taught that correct use of the gear box and planning gear changes was paramount, especially with the 3 speed gear box – no synchro on 1st – in the upright Ford Popular I owned and learned to drive on. Even before I learned to drive, when talking to bus drivers, it became apparent that taking off in 2nd was normal practice as the gearing and axle ratios were such that 1st was for use only on hills or when fully loaded. From the very limited driving experience I have on crash and synchro geared buses (PD2, Bedford VAM, Royal Tiger and Leopard) I was always told to start in 2nd. I once did a day’s familiarisation/assessment course in the early 1990s with a driver training school when I considered obtaining a licence to do weekend coach driving, an aspiration abandoned when my business picked up, and 2nd gear starts were advocated as the norm though the times when 1st should be used and when to use 1st on the test were outlined. Driving today’s automatics is a doddle though collecting fares, dealing with queries and handling the public whilst safely conducting the vehicle through today’s traffic certainly isn’t. I would assume that, just as I only drive automatics when in the USA as they take some of the fun and skill out of driving, a certain amount of skill has been lost as the automatic box has taken over to balance the increased workload on the bus driver and when those boxes come into the workshop needing attention they are far more complex and expensive to repair than a clutch or a broken crash box. That’s an interesting observation about first gear, Roger. In cars of the middling yesteryear first gear often had no synchromesh and was harder to engage: my Mother always set off in second. Early Austin Westminsters only had three forward gears and I think any one would do. Bristol K’s- possibly 6A’s would rev furiously on the level for little result in first and clearly wanted to start in second. Irrespective of how an individual might have been instructed to drive and by whom I for one cannot accept why any bus loving enthusiast would want to inflict upon any surviving classic bus of any make treatment which if even executed with care and consideration could help to shorten its already extended life. Is it not incumbent of any genuine enthusiast preservationist to extend the working life of our current public transport heritage by treating it in a caring and considerate manner? Consideration for me would mean setting off in first gear although not necessarily in crawler where fitted. We must not forget some of the parts which are fitted to many of our current classics will no longer be available should repairs be necessary so why treat them in a manner which could potentially hasten the demise of any preserved bus or coach. The trick for engaging a non synchromesh first gear on a gearbox with synchromesh on the higher gears is to engage initially one of the higher (synchronised) gears to better match the speeds of the mainshaft and layshaft, and then swiftly move into the desired first ratio, keeping the clutch down all the time. There cannot be many gearboxes of this type on modern cars (or buses), but the same method is good practice for engaging reverse on today’s gearboxes. How often do we hear many motorists, who are clearly unsympathetic towards machinery, start a cold engine (which then revs at a higher speed than it does when settled) and then slam the transmission into reverse provoking audible protest from the cogs? Engaging a forward gear first makes clean engagement of reverse rather easier. I even adopted this procedure on semi automatic buses. After idling in neutral at a stop, I would engage top gear and then the starting gear to avoid the jolt that always occurred if the engine idling speed was absorbed by the low ratio. Getting back to the first v second gear issue, I can fully understand Mike B’s concern in relation to preserved vehicles. These must be treated with a high degree of respect, and it is inevitable that some of today’s volunteer drivers simply cannot acquire the experience required to handle these machines with the level of assurance or accomplishment possessed by good, seasoned PSV drivers of the past. Every stratagem should be employed to minimise mechanical stresses on our heritage vehicles, and caution is entirely warranted. Sadly, a lack of caution is all too prevalent with historic aircraft, where over exuberance at air displays has sometimes had devastating results. Roger has succinctly laid out the proper and approved method of driving adhered to by thousands of good drivers over many years. Andrew seems to have deliberately misunderstood him. Of course we don’t treat 40, 50, 60 year old buses in the same way we would would when they were new. I am a PCV/PSV driver and advanced motorist and approach each individual vehicle I drive with sympathy. I was going to keep quiet on this one, but I can’t let these comments slip by un-noted. Your last couple of sentences are so right, Roger. It’s as bad, if not worse, with old planes where a misjudgement writes off the whole aircraft. I’ve not forgotten our sole Blenheim which had taken years to assemble, being severely damaged by a gung-ho pilot who’d had nothing to do with the restoration. It took the poor owners and enthusiasts years to put it back into flying order. How they had the courage and self-discipline to do it amazes me, after such a setback. Andrew, taking care and careful driving of preserved vehicles and discussing what went on/goes on in service – which is the what I thought we were discussing – are two different matters. Mike B, in his last sentence, added in the handling of preserved vehicles. These, of course, should be driven correctly and correctly may well mean in a different manner to that which the outside observer feels is correct. Roger’s earlier analysis of the use of second gear in normal service earlier in the thread matches my observations of the industry over a 50+ year period and I fully endorse his remarks regarding the handling of preserved aircraft at airshows. I’ve seen too many crashes and lost a number of friends and acquaintances due to such handling. Yesterday I said that I was not that worried as to why or how an individual was taught to drive a PSV in a particular way and whatever the merits of differing approaches and styles were back in the 1950’s, 1960’s or even into the 1970’s unless the style of driving back then impacts on the way the current preserved buses especially those with a conventional gearbox are driven then only best practice is acceptable. Being active in the preservation field we are faced on an all too frequent basis when so called PSV drivers with long careers in the public passenger service come along with a driving technique which is totally unsuitable for preserved buses. Andrew, why are you using pejorative language? This is a friendly and discursive forum open to all sorts of views and sometimes friendly disagreements. To call drivers with years of experience "so called experts" is grossly unfair. They drove those often poorly equipped vehicles, often for basic pay, and learned how to get the best out of those vehicles for their employer, their passengers and themselves. I can understand frustration IF you explain not just that you want one of your vehicles driven in a certain way but why, and then you are ignored, but it seems to me that fitting different gearing or axles to facilitate running to and from rallies is not preservation in the true sense as the vehicle is not in its original form. What you are doing is preserving the look of the visible vehicle, i.e. the body and visible mechanical parts to represent what the vehicle looked like at a particular time. Nothing wrong with that so long as the distinction is made between a truly preserved vehicle with the original gearing/engine/performance, body (or totally accurate modern copies) and a vehicle which, to represent a type and facilitate easier handling/mobility, has been modified. As I pointed in another thread where Orla Nutting stated that the engine and gearbox on the preserved Stockport Tiger Cub had been replaced by a Royal Tiger engine and Albion 3 speed box, it will sound very different to the original. I’ve every respect for people who spend selfless hours and a great deal of money to represent, either in fully or partially preserved form, vehicles and machinery of all kinds from what was once a very lively industrial base. Please don’t spoil that respect by insulting those that had to use the machinery on a day to day basis and know far better than you how it had to be used. If you treat them with respect most of them will listen and give back to you in kind. Those that don’t obviously won’t drive for you again. Good point well put, Phil, its a bit like the axe in the museum that’s only had two heads and three handles, but it looks original. It does appear to me that the preserved vehicle fraternity, to whom we are all extremely grateful for their tireless endeavour and commitment in maintaining our transport heritage, are rather missing the point here. All the other contributors above have drawn the distinction between the realities of everyday operation in the past and the careful preservation in the present. When vehicles such as these were in full passenger carrying service they ran out at something like 5 o’clock in the morning and toiled ceaselessly with a succession of crews all day up to around midnight, day after day, year upon year. Their drivers would handle these buses in concentrated spells of four to five and a half hours at a time, carrying very heavy passenger loads on tightly scheduled routes, often with six or more stops to the mile. These drivers acquired a degree of familiarity and skill with their machinery, together with a commensurate respect, that cannot be dismissed as "so called". They spent more time behind the wheel of a bus in a week than the average enthusiast does in a year. This is a world away from the present day preservationist movement, where, quite rightly, discretion is the better part of almost everything else. To hark back to the aviation analogy, fully bomb loaded Stirlings, Halifaxes and Lancasters would take off in the blackness of night, often in the foulest weather, and fly far into Germany, taking evasive action against night fighters and flak before dropping their bombs and facing a similar set of hazards on the return trip. This is a far cry from a present day doddle round Duxford in a Dragon Rapide during a sun drenched summer afternoon. As I said above, Thank you Roger and Phil. Surely it is all a matter of what gear/differential ratios and what power and torque output are provided on the individual vehicle, One operator’s PD2 would be entirely differently geared to another’s PD2. It would depend on the local terrain and what type of service it was to be used on – frequently stopping or long, only occasionally stopping interurban. There is simply not a one-size-fits-all style of driving. Mike B. suggested that Driving Schools had their own agendas and may have taught their trainees to make fewer gear changes in order that this would reduce the likelihood of making mistakes (so presumably maximising test pass results). I was a PSV/PCV Instructor for 18 years and knew all the instructors at the various depots in our region of the company as well as getting to meet many others from other companies around the country. I can assure him that this was not the case at all. We all taught trainees to demonstrate Vehicle Sympathy, appropriate to the individual vehicle and circumstances. Second gear or first gear when moving off,……part of the PCV Diving test is an exercise in moving away downhill and the correct method is to engage second gear release the handbrake holding the vehicle on the foot brake then transfer your foot to the accelerator and move away. I think anywhere a bus rolls forward when brake released can be moved away in second gear. Back to the FRJ Daimlers that dominated the Salford fleet during my student days in Manchester. Have any of them survived into preservation? I noted the particular Salford feature of extended indicator handles, allowing the conductor to turn them while standing on the road, unlike my experience during summer holiday work with PD2’s of IOM Road Services, where in order to reach the handle, I had to place the right foot in a stirrup alongside the radiator, left foot along the top edge of the number plate and use the left hand to hold on to a handle on the cab side. I recall that , in contrast to Manchester, Salford employed a significant number of ‘clippies’, and so wonder if this feature was to save them the indignity (or even impossibility for the shorter ones) of climbing across the front of the vehicle to reach the handles. Manchester’s indicators (requiring 4 handles rather that Salford’s 2) and those of many other operators were inside the driver’s cab; I wonder why Salford didn’t do likewise? I am pretty sure that 511(FRJ 511) is still in preservation somewhere, but not sure where. Incidentally, the first Salford Atlanteans and Fleetlines (and maybe other operators) had a rear service number. This was changed by opening a step on the rear bustle in order to reach the handles, hopefully with the driver’s knowledge that you were there! In answer to M Jones, FRJ 511 features in the 2012 PSVC listing, as being with the 4100 Group in Manchester. Salford’s Transport Committee approved the use of adverts on its vehicles and these started to appear in May 1968. There are pictures in Manchester and Salford A Century of Municipal Transport in the Glory Days series of publications of a Phoenix bodied CVG6 and an Atlantean carrying ads, the former in summer 1968, the latter in May 1969. In addition there is a photo of a PD2 with an ad at Agecroft. Undated it is in full Salford livery with its Salford fleet number and as the photos tend to be in sequence, it falls well before any hint of SELNEC. There is an oddity in the book. A photo of 151, the first PD2, is shown at the Weaste terminus of service 3. This purports to have been taken in 1963. The photo is almost head on but the nearside between decks panels are covered by an advert of some kind which, though the content cannot be discerned, is a white background with red and possibly blue print. Page 82 of the book refers for those who have a copy. Can I please ask what a ‘Phoenix’ body is? I have never come across one of these. Phil, with reference to the adverts on Salford 151, the most helpful photos I could find were in Henry Conn’s part 9 of British Buses, Trams & Trolleybuses 1950s-1970s. (page 112). Other possible clues are on the cover & page117 of Eric Gray’s SCT. The heading photo is a Phoenix body. Andrew, please give details as I don’t have the publications. Sorry to labour the point, but is the Phoenix name then, a design name like the Farringdon, or the Orion body style names? As I said I have never heard of it. I must have been living in a vacuum for 60+ years. Yes Stephen, it is a design name. It has some commonality to the Metro-Cammell Birmingham standard design of the period. Salford City Transport, Edward Gray, TPC April 1975, ISBN 0 903839 06 7. Part 9 Greater Manchester, Lancashire & Cumbria, Henry Conn, Silver Link Publishing 2012. The cover of the first book shows a PD2 in Selnec days with an advert for the Leek & Westbourne building society (forerunner to Britannia). This is basically red with white lettering, and also appears in the page117 view of Victoria (Green Selnec PD2). In book 2 on page 112 this advert again appears, together with a heating advert which I have failed to decipher but the colours seem right. There is beer advert carried by MCTD 3484 on page 41 of Stewart Brown’s Greater Manchester Buses,Capital Transport 1995 ISBN185414 174 0 which looks a possible answer for Salford 151. Stephen, the Phoenix name came from the way this fleet of Daimlers allowed Salford to rise out of the ashes of what had been a really run-down fleet into one in which everybody could have considerable pride. I think it was only an unofficial name and would only apply to Salford due to the circumstances. Stephen, you’re not alone. I’ve never heard of the Phoenix body either, and my period of ignorance extends to 70+ years. Is this a Victory Daimler with a Phoenix body raised from the ashes of war-time maintenance? ? Very poetic. David, I doubt very much that the Phoenix name had anything to do with Salford and its regeneration under Charles Baroth. I first came across the name in the late 1950s on a tour of Hyde Rd works when a number of Manchester’s first batch of their variation of the body type were undergoing maintenance. These differed in detail, such as stairs and radiator, from the Salford vehicles but, as Eyre and Heaps say on page 351 of the Manchester Bus, "the body design was Metro Cammell’s standard Phoenix design with only minor modifications to Manchester’s specification"
I think that I would just accept that the date in M&S Glory Days is incorrect and maybe a typo for 1968. The nearside mudguard of the bus looks to be slightly misshapen which might suggest that it is a post Baroth picture. The picture of 253 on page 86 of the same book carries an advert for solid fuel fires, the strapline for which is ‘Welcome Home to the living fire that you know is cheaper to run’ This was definitely an advert borne in the early days of SELNEC, 1970, and also featured on ex-Bury buses in Henry Conn’s wonderful book as well as Salford’s 254 as noted by Andrew Gosling. As I understand it, the term ‘Phoenix’ was used by Metro-Cammell to describe one of its designs. It’s not a Daimler term. It isn’t included under Metro-Cammell in the PSV Circle listings of body codes (though there is a ‘Phoenix’ with body code PIC which maybe no relation whatsoever). Although Met-Camm produced other bodies very similar to the Manchester and Salford bodies, most notably for BCT and West Bromwich the term ‘Phoenix’ only seems to be applied to those for the two Lancashire undertakings. ‘The Manchester Bus’, (Heaps & Eyres) makes several references to the term. I wonder – Could the ‘brand name’ Phoenix be a fore-runner of the Orion? Like others I only came to know the Phoenix name late in life, but since then have always assumed it to be an invention of MCW, the joint marketing division of Metro-Cammell and Weymann until manufacturing was moved under its wing in 1966. MCW had a tendency to use names related to ancient mythology: Hermes was a Greek god; Orion was a huntsman; Aurora was the Roman goddess of dawn; Phoenix was a mythological bird. Leyland did likewise with Titan and Atlantean, so their combined effort to produce the Olympic was a marriage made in ancient Greek heaven (on top of Mount Olympus, where the Greek gods lived). and of course the desti display should always have been SWINTON and never Pendlebury! The same drivers on the 64 and 66 never showed MONTON GREEN as the desti for the 66 which did precisely the same thing (Piccadilly) – Pendleton- Eccles- Peel Green with the 64 direct VIA Patricroft and the 66 ( like the 57 ) running VIA Monton Green and not terminating there. So the idle practice of showing incorrectly PENDLEBURY would never enter their heads on the 66, they always showed ‘PEEL GREEN New Lane’ on both routes. If going to be a FK garage vilain I would have said at least be CONSISTENT ! Used to look ridiculous the bus entering Swinton via Station Road having already served Pendlebury and declaring the nonsensical destination ‘PENDLEBURY’. The official practice of showing Pendlebury as the destination of the 56 (formerly the 77) goes back to Salford City Transport days, when there were no via blinds. There is nothing ‘idle’ about doing what you are told to do. If it’s of interest, there is (or was until recently) an old ‘E’ Reg PD of Salford City being used for promotional purposes here in West Cork, Ireland. After decommissioning from front line work, I think it went to Scotland as a training vehicle, before doing a similar function in Belgium or Holland. When I last saw it, it was parked up in Clonakilty, boldly advertising Clonakilty Black Pudding, and I can do a bit of ferretting if required or the company has its own website that you could contact for info. PS – Having now found the notes I made when I researched this vehicle before, it was JRJ 268E which I have down as Salford/SELNEC before going to E Scottish as a trainer vehicle, followed by a similar stint at Trent. No doubt those with an interest will be able to take it from there?